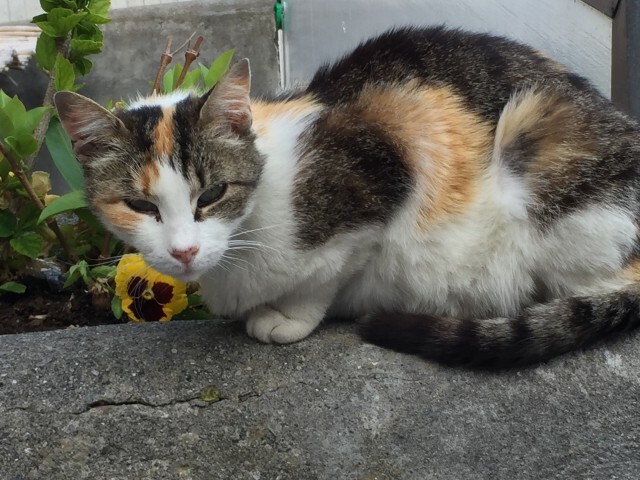 Have you noticed that cats in Italy seem to be everywhere? Cats in Italy seem to be everywhere. Maybe I just notice them more since most live outside. These cats, gatti, seem to appear in every single town I visit. I must say though, that I do not recall seeing them in the larger cities of Venice, Florence, and Naples, but I am sure they are there. Because I am a cat lover and have had several cats of my own, seeing these kitties in Italy always brings a smile to my face. 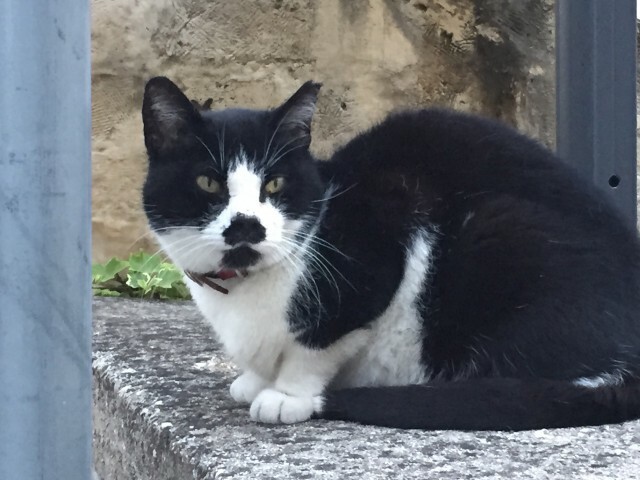 This little tuxedo cat in Poliganano a Mare was darling but his owner told us he is crazy and his name is Schizzo. 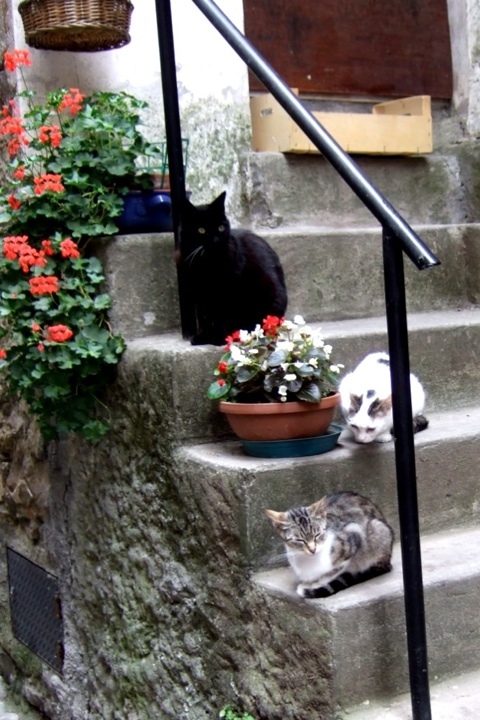 These well-fed cats roam the streets of the Ligurian town of Apricale. 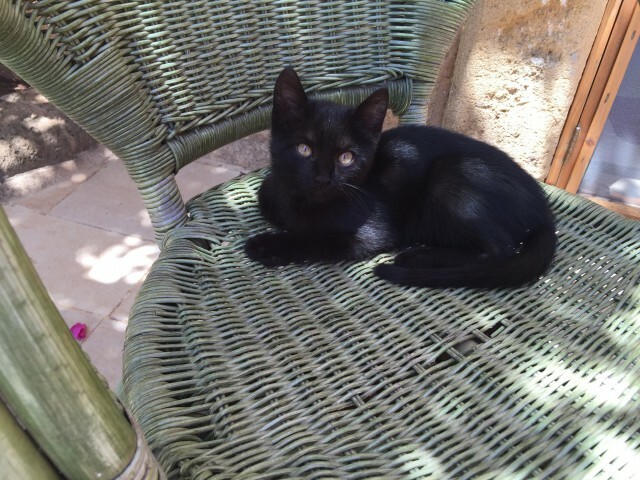 I took a liking to this little black kitten who lived at Masseria Provenzani in Puglia. 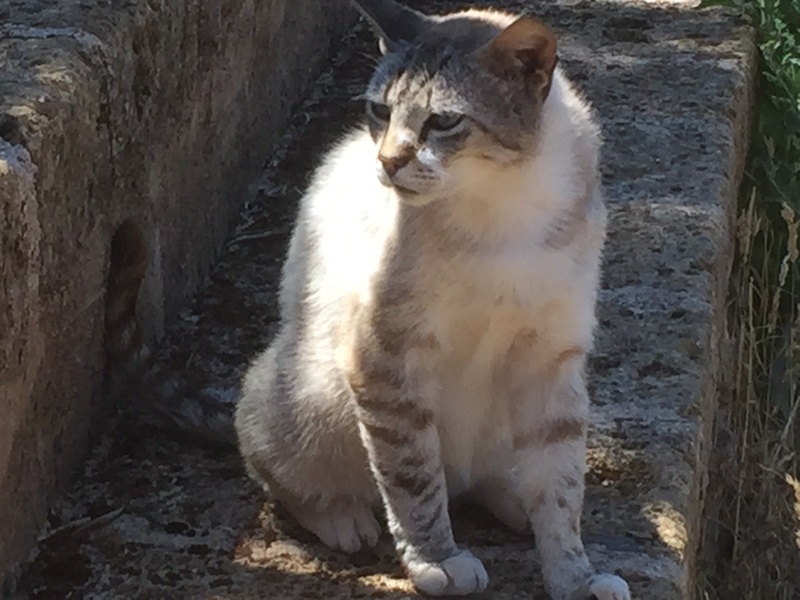 This big kitty also lived at the masseria just outside Squinzano and near Lecce in Puglia. These kitties and their mamma lived just below our B&B in Polignano a Mare…So cute. Are you a cat lover? I’d love to hear your feedback. Please leave a comment. Grazie mille! Have you checked out my books on Italy? Available on Amazon. I’m looking at that farm cat and wondering where he came from. His head attitude is the same as the large cats and not at all similar to house or patio cats. Very interesting big fellow. I have to go now as the five cats I live with don’t like me to stay online too long! The dog doesn’t disagree. We have learned to let the cats have their way with us. Thanks for commenting, Bonnie…and I see that you learned quickly who is in charge. I always see lots of cats in villages in Italy, not all are well cared for, but all manage to find the very best spots in the sun. I love cats especially my little Sophie. 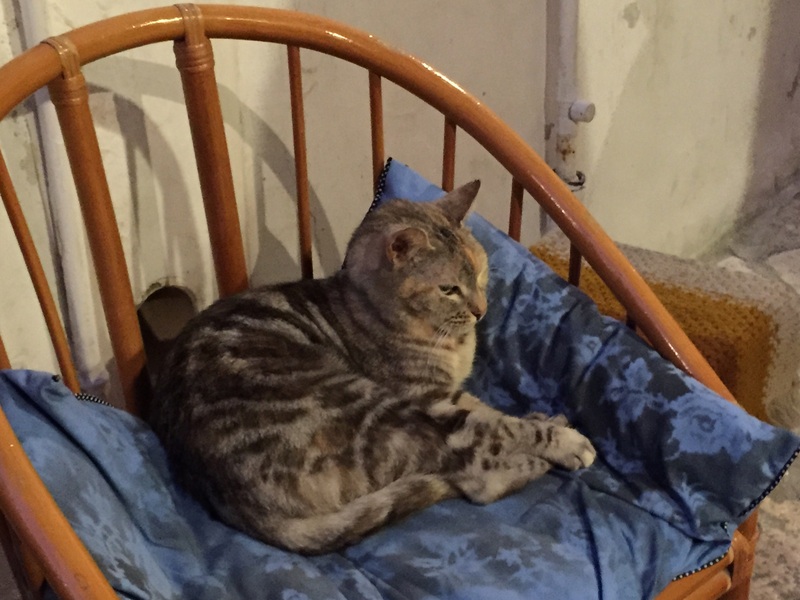 The Italians love their cats and dogs, it is always a pleasure to see them so content and well cared for. As a cat lover, I find cats everywhere I go also! As you’ve said, most people in Italy will feed them but let them live outside, which is not really a bad life in Italy, where the weather is warmer than here in the US. My favorite cat photo is of a cat I found curled up in his own little basket on a shop step in Ragusa,Sicily. He looked so relaxed and comfortable sleeping among the noise of the piazza from all of the townspeople and tourists! I love the cats in Italy, also. Around the Largo di Argentina, in Rome, there are so many cats, but volunteers feed them and seem to look after the cats. I enjoy your photos, also. BTW, Just finished your novel, “Critical Coverup”, around midnight last night. I had to finish it!! Very good writing, and suspenseful. Dolly, thank you so much for the kind words. I’m thrilled you enjoyed Critical Cover-Up…Yes I am familiar with the large volunteer cat sanctuary in Rome…Those cat ladies are revered. We spotted a few adorable cats relaxing in the shade in Orvietto! You can’t help but enjoy them, right? ?